If you are looking to be a HR Consultant then you will an experienced HR professional with a few years experience behind you. You may even be CIPD qualified or working towards this combined with your previous work history experience. In this role you need to be able to go and visit clients and support them in their HR practices, provide advice and deal with any changes or issues that they may be having. You will be a confident communicator in this role and be happy working on your own initiative for the majority of your weeks. HR Consultants can earn around £17,000 to £23,000 a year. If you have experience in HR then your earnings can be up to £27,000 a year. I would like to apply for the role of HR Consultant which you have advertised in (where) and (when). Please find attached my latest CV which shows in detail my experiences and skills. I am a CIPD qualified HR professional and have been working in a HR environment for (how many years – if this is true). I enjoy working in a HR environment because I like the changes that are made and helping to implement these. I have provided advice to staff and Managers regarding recruitment, interviewing, disciplinary, appeals, tribunals and also on employment contracts, offer letters, employee handbooks etc. I have also held training sessions with managers on how to deal effectively with certain situations. I like to keep up to date with the latest HR changes and read any publications that I can to keep on top of these changes. I am a confident communicator who enjoys working with other people and providing advice as well as listening carefully and helping staff to resolve any issues they may have. I like to make my working environment a safe and pleasant place to work for all concerned. 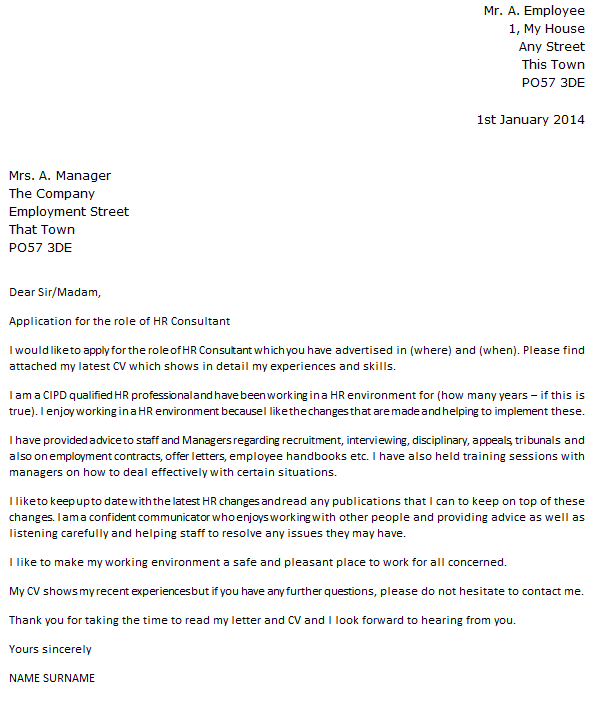 My CV shows my recent experiences but if you have any further questions, please do not hesitate to contact me.